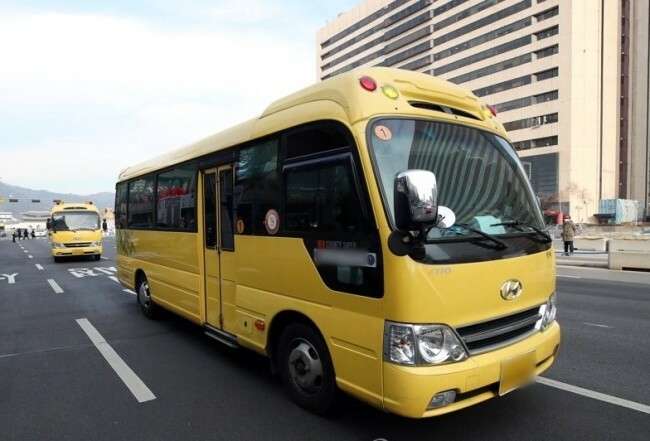 South Korea will implement a law this week aimed at requiring operators of day care centers and kindergartens to install devices that prevent children from dying or suffering harm after being left alone aboard school buses, the Korean National Police Agency said Monday. Under the revised law concerning roads and traffic, the driver of a school bus is required to walk to the back of the vehicle to check whether all passengers have disembarked. The law on the "sleeping child check" system, which will be enforced starting Wednesday, requires the driver to press a button, installed at the back of a bus, to confirm whether there are any children left onboard within three minutes of stopping the engine or removing the ignition key. If the driver fails to do so, an alarm goes off. The enactment of the revised law, which was promulgated in October last year, follows the death in July the same year of a four-year-old girl who was left for eight hours on a hot day care center bus in Dongducheon, north of Seoul. A three-year-old boy has been in a coma since he was left inside a school bus for seven hours in July 2016 in the southwestern city of Gwangju. Fines of up to 130,000 won (around $114.03) and 20 penalty points will be imposed on those who do not conform to the measure.